There are three referendum issue on the ballot for next Tuesday’s, November 7, election. They are the Special Purpose Optional Sales Tax (SPLOST), Equalized Homestead Optional Sales Tax (EHOST) and Property Tax Assessment Freeze for those owning and living in their own home. I wrote an Educational Information article, in plain language, in this week’s (November 1) Crier. Please read that article to get yourself educated on the aspects of all three referendums. Personally, I supposed all three referendums and will vote yes. Also, all three Dunwoody City Council Local seat will be on the ballot. You will get to choose the representative to represent you and the City of Dunwoody for the next four yeas. You will only be able to vote on the representative for the District in which you live. Voting … Early voting, sponsored by the cities of Dunwoody and Doraville, is still available at the Dunwoody Library today until 5 PM and tomorrow ... Friday, November 3 ... from 8 AM to 5 PM. Regular voting will be at your normal polling location next Tuesday, November 7, from 7 AM to 7 PM. However or for whoever you are voting … PLEASE VOTE! For more information visit the Dunwoody website … Dunwoodyga.gov …. 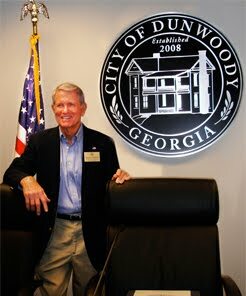 City of Dunwoody Voters Information Page. 3. Veteran’s Day Ceremony … This city annual event honoring our Veterans of all services will be held Saturday, November 11 from 10 to 11 AM at the Brook Run Park Veteran’s Memorial. Come honor those who have honored us with their service to our Country. 4. Light Up Dunwoody … This annual event will take place November 19 from 3 to 6 PM at the Spruill Dunwoody Farm House. 5. City Council Meetings … Due to the Thanksgiving and Christmas/Hanukkah holidays there will be only one city council meeting in November and December … November 13 and December 11. 6. Fall is Here … Fall is upon us and that means lot of leaves. Please don’t let your leaves go down the storm water/sewer street drains. Allowing leaves to enter the storm water/sewer system clogs our system and causes a waste of our tax dollars. 1. Volunteer Day … The annual Clean, Fix and Shine-Up Dunwoody event is this Saturday, OCT 14. Meet at Brook Run Park at 8:45 AM for a 9 AM start time. Tree planting, park enhancements and street sign cleaning will take place at this annual community spirit building event. Bring your work clothes and be ready to work. If you have street signs in front of your property please be ready to provide water via hose or buckets for our sign cleaners. Go to Dunwoodyga.gov/parks to sign up. Walk up registration will also be available. 2. Dunwoody Rotary Fun Run … This popular annual family-fun charity event will take place this Sunday, OCT 15 at Perimeter Center Mall for start and finish. Registration starts at 7 AM and the 5 K race starts at 8 AM and the 1 mile run starts at 9 AM. 3. Recycle “Blue Box” Trade In … You can bring you small 18 gallon Blue Box (it will soon be obsolete) for a trade in for a 35 gallon blue recycle bin for free or a 65 gallon blue recycle for $15 to Brook Run Park this Saturday, OCT 14 from 9 AM to 12 PM or to City Hall on OCT 22 from 1 PM to 4 PM. There is paperwork to fill out. Go to DeKalb Sanitation Recycle Bin Trade-In for more information. 4. Paving … Paving, except for some stripping, some calming devices and some streets in Wyntercreek, where new gas lines will be installed starting Monday, OCT 16, for 2017 has been completed. 6. November Election Voting … There will be early/advanced voting in Dunwoody at the Dunwoody Library on Saturday, OCT 28 from 9 AM - 4 PM and OCT 30 - NOV 3 from 8 AM - 5 PM. Absentee ballot voting opens today, OCT 13, and the last date to mail an absentee ballot is NOV 3 - my suggestion is to mail your ballot in NLT NOV 1. The ballot has to be at the DC voting office by 7 PM on NOV 7 to be counted. Early/advanced voting Is also available weekdays at the DC Election Office, 4380 Memorial Dr, Suite 300, Decatur, GA 30032 starting OCT 16 - NOV 3 for 8 AM - 5 PM. Election day - NOV 7 - polls will be open 7 AM - 7 PM. For more information on the NOV election voting go to … http://www.dekalbvotes.com … you can also call 404-298-4020. FYI, Dunwoody High School is NO longer a polling place and those of you that used to vote there should have rx a letter instructing you where to vote. If you didn’t rx the letter you can go to the website above or call the Ph # above to get your polling place. Who/how you vote for is your business but please exercise your voting privilege as an American citizen. 7. Harvest Farm Fest … This funny-filled day family event sponsored by Boy Scout Troop 477 will be held OCT 21 from 12 Noon - 9 PM at the Donaldson Bannister Farm - 4831 Chamblee Dunwoody Rd. The Scouts will take you on a interactive tour back in time to the 20th century and bring history to life through guided time travel. Admission is free and there is a small charge for games and the tour. Bring the family and support our Scouts. 8. Promotion … Officer Blake Yeargin will be promoted the SGT in the DPD this TU, OCT 17 at 3 PM in the Council Chambers in our city hall. 9. New City Hall … I toured our new city hall at 4800 Ashford Dunwoody yesterday. The build out is still on schedule. To answer those that have ask … yes, once we get into the new building and get settled we will have tours of our new city hall for our citizens. 10. 2018 City Budget … The 2018 Dunwoody City Budget is on our website - dunwoodyga.gov. Please review the budget and let us know your thoughts. The budget will be voted on at the OCT 23 city council meeting. 1. Weather … rain is forecast to continue at the current pace through Tuesday morning when the rain should start tampering off at around 7 - 8 AM. The forecast is for 3” - 5” of rain. The heavies of the rain is forecast between 1 - 7 PM today caused by a “squall line.” Squall lines can cause some dangerous weather. Winds will continue to increase and peak this evening between 5 - 7 PM at a sustained 35 MPH. There is also the possibility of gust over 50 MPH. Winds are forecast to then start to slowly decrease to reach a safer level at 8 AM on Tuesday. All this means one thing … this is the time to take serious safety precautions for you, your family and our fellow citizens in need. The rain and wind combination will most likely knock some trees down and take out some power lines. If you see downed power lines stay well clear of the area and contact Georgia Power …Ph# 888-891-0938. To check status of power outages go to www.georgiapower.com/storm . The rain could cause some flash flooding which could cause areas where streets are not passible. … stay off the streets if at all possible. Personal safety and the safety of those around should be your # 1 priority today! Stay tuned to the local media for fast developing weather updates. 2. Dunwoody Operations …. Except for Police and emergency personal the city government is closed today. A decision on operations for Tuesday will be made after 3 PM today. Go to the city website dunwoodyga.gov for updates. 4. MARTA … MARTA has suspended all bus and rail operations for today. This information via the Dekalb Emergency Management Agency. 5. Sanitation … There is no sanitation pick up today. This means that sanitation pick up in Dunwoody will the moved back at least one day. For update go to www.dekalbcountyga.gov/sanitation/about-sanitation. Please do not put anything out to the curb as with the heavy winds items at the curb can be blown in the air creating dangerous situations. 6. City Council Meeting … The City Council Meeting for tonight has been postponed and has been rescheduled for next Monday, SEP 18, at 6 PM. 1. United States House Representative Karen Handel … Tonight we will be honored to have our U S House Representative Karen Handel at City Council meeting. Representative Handel will be there at 6 PM to give us a briefing on the latest news from Washington, DC especially the information that effects the citizens of Dunwoody and the entire Georgia 6th District. Request you make every effort to attend and give Rep Handel a warm Dunwoody welcome. 2.Paving … The paving on Ashford Dunwoody Rd is in its final stages of completion. We have experience some warm dry days recently which has aided this process. FYI, when a road is newly paved we have to wait about 30 days until the asphalt has cured before we can put down the finished road striping. This paving crew will be moving over to continue the paving on Chamblee Dunwoody Rd from Cambridge towards the Chamblee Dunwoody Rd / Peeler intersection in a couple of weeks. At this time we are planning to do that paving at night. There is another paving crew that is working on paving residential streets during the day. This crew has finished most of the paving on the east side of the city and is now moving westward across the city. A lady emailed me after my last update and questioned why the speed control items weren’t installed on N Peachtree Rd. As I noted above it takes some time for the new asphalt to completely cured. If we were to bring in the heavy equipment to installed the speed control items prior to the asphalt being completely cured it would cause sever damage to the newly paved road. 3. Park Master Plan … At tonight’s meeting we will be discussing this plan. This plan has goals with “Short Term, 0 - 3 years” - "Medium Term, 4 - 6 years" and “Long Term, 6 + years." There are two major challenges with this plan … (1) funding, as the plan has a cost higher than our financial capability and thus (2) setting priorities within a park and among parks considering the funds available. 4. Recycle Event … The next electronic recycle event will take place on SEP 17, 2017 from 1 to 4 PM at St Luke’s Presbyterian Church, 1978 Mt Vernon Rd. Preregistration is required … by NLT SEP 14th. Contact Kevin Turner at … kevin.turner@dunwoodyga.gov. 5. Property on the SE Corner of Mt Vernon Rd and Chamblee Dunwoody Rd … As you have noted construction has stopped on this lot. As we understand it the company that was building there is now in the process of possibly terminating those plans. More information to follow as it becomes available. In the mean time we are working on getting the sidewalk reopened. 6. Dunwoody Woman’s Club (DWC) Home Tour … This popular annual event will be held on OCT 4, 2017 from 9:30 AM to 3 PM. You can buy tickets from any DWC member. For more information go to … www.dunwoodywomansclub.com. 7. Mayor’s Town Hall Meeting with the Dunwoody HOA and Swim and Tennis Leadership … We had the first of two meetings last Thursday and I thank those who attended. The second meeting will be held on Saturday, SEP 30, 2017 from 9:30 to 11:30 AM at Dunwoody United Methodist Church on Mt Vernon Rd. The purpose of these meeting is to enhance transparency by getting information out to our citizens at the “grass roots” level and for me to receive input back from these local leaders. These meeting are open forum style meetings. To register contact Bob Mullen at … bob.mullen@dunwoodyga.gov. 3. Glass Recycling … As of JUL 17 DC is no longer accepting glass items in our recycle bins. As I understand it was a lack of economical marketability. As an alternative the DC Sanitation has put glass recycling bins around the County. Dunwoody has three locations for you to continue to deposit your glass recyclable items. These locations are … Brook Run Park, DC Fire Station # 12 on Roberts Dr and the Dunwoody Library. This approach will make the recyclable glass items a more marketable and positive cash flow resource for the recycler. 4. Home Owners Association and Swim and Tennis Club Leadership Town Hall Meeting with the Mayor (thats me). … There will be two of these meetings. The first will take place on AUG 24 from 6 - 8 PM at the Congregation Ariel Synagogue located at 5227 Tilly Mill Rd and the second meeting will take place on SEP 30 from 9:30 - 11:30 AM at Dunwoody United Methodist Church at 1548 Mt Vernon Rd. Both of these meeting will be an open forum to discuss items of interest to our HOAs and Swim and Tennis Club leadership. If the head of the organization is unable to attend either session we ask they send their assistant or a representative. To sign up email Bob Mullen at Bobmullen@dunwoodyga.gov. Next Monday, AUG 14 at 6 PM we will honor Principal Tom McFerrin of DHS with a Proclamation from the City. There are many adjectives to describe Tom … outstanding, superb leadership, etc. … just to name a few for the enhancement he has brought to DHS and thus our entire city. I know we will have a large crowd of thankful students, parents and other citizens present to show Tom our heartfelt thanks! He is a great American! On Monday AUG 28 at 6 PM we will have the honor of hosting The Honorable Karen Handel, our newly elected U S Representative from our 6th District, at our City Council meeting. Karen is a very personable person so lets all show up to give her a warm and respectful Dunwoody welcome. Butterfly Festival at DNC AUG 19 from 10 AM - 4 PM. Advance sign up at … http://dunwoodynature.org/learn/annual-events/butterfly/. Warning this popular event sells out as it is fun for the whole family. Food Truck Thursday are on going at Brook Run Park starting at 5 PM every Thursday. 1. Chamblee Dunwoody Rd Paving Situation … No one is more frustrated with this situation than myself and my fellow City Council Members .. we also drive that road. Here is some background on this situation … we signed an Inter-Governmental Agreement (IGA) with DeKalb County (DC) which stated that DC would have oversight, supervision and payment responsibility for the installation of the new water line including backfilling the area of the new waterline up to even grade with the rest of the road. The city’s responsibility was to patch the road in the areas other than where the water line was installed and then app;y the asphalt “topcoat" over the entire road. Shortly after this was all accomplished the road started to deteriorate along that portion of the road where the water line was installed. Upon investigation it was found that the backfill of the water line that was DC responsibility was not installed/compacted properly and this created the failures on Chamblee Dunwoody Rd. As one who has done some road construction I can tell you that compaction is key to successful road construction. So where are we now … first we had to convince DC and the contractor that they were responsibility for the failures. One of the ways we did this was withholding payment … yes it is not going to cost the city any extra funds … just a lot of pain. Secondly it takes a heck of a lot longer to redo a project than to do it right the first time. We have to remove all the of the backfill material and replace it with new material. The backfill material we are using - yes we are not doing the work but we have taken oversight construction responsibility - to backfill around the waterline. The material we have to use losses some of it compaction qualities if it get wet prior to putting the initial asphalt cap in place … with the wet weather we have been having this has slowed the repair process. I have brought this and other matters that affects our citizen's quality of life that are the responsibility of DC to the attention of our local DCBOC representative and we await action. I offer the above not as an excuse … I don’t like excuses … but as a background of the situation. 2. U S 6th District Voting … You have two more days to early vote in this congressional race. Of course the most convenient location for Dunwoody citizens to early vote is at the Dunwoody United Methodist Church on Mt Vernon Rd in Dunwoody from 8 AM to 6 PM tomorrow and Friday. Regular Election Day will be next Tuesday, JUN 20, 2017 at your normal polling place throughout Dunwoody … polls will are open from 7 AM to 7 PM. Folks have ask me who to vote for in this election … as I have said in the past it is not my place to tell you who to vote for … that is strictly your decision. I will tell you who I am voting for and you can take that for whatever it is worth. I will be voting for Karen Handel. She lives in the District, has a proven record of fiscal responsibility and has proved she can work with elected officials from both parties. We fought for several years to bring local control to and enhance the lives of our citizens in Dunwoody and there is no way I will vote for someone who is an outsider and doesn’t even live in our District. I don’t like folks that are not only from outside our District but also outside our state of Georgia trying to “buy” the election. An election should not be won by who has the most campaign funds but rather by who is the most qualified. I also question a candidate who says he is going to create jobs and yet he is personally affiliated with a business outside the borders of the United States. It just doesn’t add up. Having said that whoever you are going to vote for … Please Vote! 3. Tax Millage Rate … We have had two public meeting on our Dunwoody tax millage rate and will have the third one on JUN 19 at 8 AM at city hall. We are recommending to maintain our tax millage rate at 2.74 mils. This is the same tax rate we have had since we became a city and it is one of the lowest tax rates in any city in the greater Atlanta area. We are required by law to hold these public meetings even if our tax millage rate is not increased but our estimated tax digest/revenue (property tax revenue) will increase and, we have to advertise it as a tax increase. I wonder what political genius thought up that idea! I would understand the meeting requirements only if we were increasing our tax millage rate … but again, we haven’t had never had an increase in the tax millage rate. 4. City Financial Audit … The 2016 city audit by an outside audit firm has given your city a clean audit report. We owe our entire staff financial team and city staff leadership a “thanks” for a continued job well done. 5. The Second June City Council Meeting … The will not be a second city council meeting in June due to several of us attending the annual Georgia Municipal Association meeting in Savannah. Again there is no city council meeting on June 26. 6. Dunwoody Restaurant Week … This annual event is being held this week June 10 - 17 at many of our outstanding restaurant here in Dunwoody. It is a good time to put down the cooking tools and treat the family and friends to great meals at reduced prices. DNC Concerts … There are three more concerts at the DNC … 6/17, 7/1 and 7/15. Concerts start at 7 PM but bring your picnic baskets and family and friends and get there early to enjoy the evening with folks from Dunwoody and surrounding areas. July 4th Parade … Get involved with the largest Independence Day Parade in Georgia as a participant or spectator .. both are important. It is a good time for everyone of all ages to celebrate our Freedom! July 22 Concert … This concert called “Groovin on the Green” will be the second of our “big name” concerts featuring the group Darlington Road. A family event that starts at 6 PM at our new park at Shallowford and Pernoshal Rds.